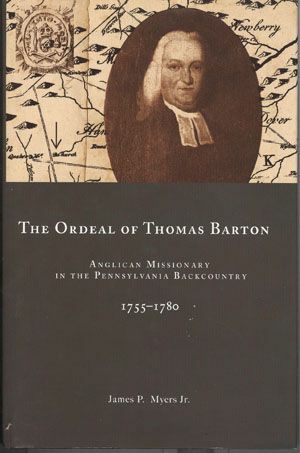 The Ordeal of Thomas Barton: Anglican Missionary in the Pennsylvania Backcountry, 1755-1780 explores the career of the Rev. Thomas Barton. Barton's ministry uniquely illuminates life on Pennsylvania's pre-Revolutionary frontier and more generally in the colonial American backcountry. As missionary for the Church of England in Pennsylvania's back-counties, Anglo-Irishman Barton championed the interests of the Anglican church and the proprietary of William Penn's children in a turbulent borderland beset by both threats from the French and their Native American allies and challenges to English authority from a largely Scots-Irish Presbyterian population. Ultimately, whatever hopes he may have nurtured when he emigrated to America were destroyed when the winds of revolution swept him to a life of loss and suffering in New York City, where he died. Drawing upon Barton's Forbes expedition journal, a large volume of extant letters, and sermons, this study seeks to appreciate the tragic life of a mid-level Anglo-Irish placeman who sought to expand his opportunities in pre-Revolutionary Pennsylvania, one of North America's most enlightened colonies. Born about 1728 in county Monaghan in the north of Ireland, Barton migrated to Pennsylvania in 1751. After beginning his American adventure as a teacher, Barton's friendship with the Rev. William Smith, provost of the Academy, later College, of Pennsylvania, led to his ordination as missionary for the Society for the Propagation of the Gospel in Foreign Parts (the SPG). Barton's first assignment took him "over Susquehanna" in 1755. One of a small but powerful political force of Anglo-Irish placemen in pre-Revolutionary America, Barton established a formal Anglican presence in the midst of a sea of largely contentious Scots-Irish Presbyterians, but also secured for the Penn proprietorship a trustworthy informant and informal executor of its interests. In this twin capacity of Anglican priest and Penn representative, Barton accompanied the successful 1758 expedition of General John Forbes against the French fortress of Fort Duquesne. In 1759, the SPG and the Penns rewarded him with a new incumbency in Lancaster, the largest inland city in the thirteen colonies. His epistolary exchanges at this time disclose a mind animated by the latitudinarian tolerance of his church, as well as a spirit inspired by the Enlightenment ideals of inquiry and learning. For all his unworldliness, however, he labored tirelessly to secure the political and economic authority of the Penns. Targeted by extreme sectarian and political fanatics during the years leading up to the American Revolution, however, Barton, a Loyalist, was ultimately evicted from Pennsylvania. After struggling for two years in New York city against poor health and dire economic want, he died in 1780, a self-defined martyr for his church and king. [Myers] offers eight appendices, running sixty-six pages, which include transcriptions of Barton’s journal when he accompanied the Forbes Expedition in 1758, reports to the Society for the Propagation of the Gospel, and two petitions to Pennsylvania’s revolutionary government. The inclusion of these documents and Myers’s highly readable text make The Ordeal of Thomas Barton a valuable work both for the insight that it provides on a middling official caught in challenging events and for the documents valuable to students and scholars. Myers' exploration of Thomas Barton's life demonstrates the important and challenging work of Anglican missionaries on the colonial American frontier. Combining political intrigue, ecumenical outreach, and an intellectual pragmatism born from the marriage of Enlightenment ideals and frontier exigencies, James P. Myers' biography of Thomas Barton will undoubtedly prove both useful and entertaining to students of colonial Anglicanism and early American religious history.